Please Note: Export Market Access is now closed and not accepting further applications. For trade show grants and other forms of export support, learn more about the CanExport program. In Canada, exporting provides a new avenue to revenue and international competitiveness. While the rewards of exporting can be immense, businesses open themselves up to a great deal of risks. To help businesses explore exporting opportunities, the federal and provincial governments provide access to export marketing grants to offset expansion costs, while reducing some of the associated risks. Two of the most popular export funding programs available to Ontario businesses include CanExport and Export Market Access (EMA). Export grants help businesses reduce the cost of performing marketing activities while establishing or expanding their presence within international markets. Though both programs share similar objectives, it is critical for businesses to know the strengths and limitations of each program. The Canadian economy depends on international trade; in 2016, Canada generated over $521 billion in global revenue, which account for 31.6% of Canada’s gross domestic product (GDP). To help Canadian businesses implement an export strategy, the government provides a range of funding options to help companies enter or expand into foreign markets. By accessing export marketing grants, businesses can enhance their international competitiveness, increase global sales, and develop foreign partnerships that lead to improved brand exposure in these new markets. Popular export funding programs amongst small and medium-sized businesses include, CanExport and Export Market Access (EMA). Both programs support international marketing activities to help businesses enter or expand into global markets. However, despite sharing similar objectives it is important for businesses to understand the differences between both programs. Both programs support international business expansion that provides new opportunities for growth in foreign markets. However, contribution amounts and the type of funding differs between the two programs. CanExport: Provides up to 25-50% coverage to a maximum $50,000 in federal funding per application. Export Market Access: Provides up to 50% coverage to a maximum $50,000 in provincial funding per application. The lifetime maximum for this program is capped at $250,000. Businesses applying for EMA grants may submit up to two applications per 12-month period, whereas CanExport applicants can submit up to two applications per government fiscal year (April 1 to March 31). To access either of these export marketing grants, businesses must determine which program is best suited for their company and whether they meet the eligibility requirements. CanExport: To be considered eligible, applicants must be a Canadian company outside of the agricultural/food & beverage industry with 1 – 250 employees and earn between $200,000 – $50,000,000 in annual revenues per year. Applicants must request a minimum of $10,000 in funding per application. Export Market Access: To be considered for funding, applicants must be an Ontario-based company (incorporated for 2+ years) with 3 – 500 employees and earn at least $300,000 in annual revenues per year. Product certifications to meet foreign government standards. The CanExport program provides Canadian government grants to help offset the costs and risks associated with international business expansion efforts. The program offers funding to allow applicants to reduce up to 50% of foreign marketing expenses, such as trade shows. Ideal projects must demonstrate how international marketing activities will allow the business to establish new contacts and connect with foreign customers. Eligible applicants may receive up to 25-50% of project expenses to a maximum $50,000 in Canadian government funding per application. CanExport grants can be used to reduce the costs of marketing activities performed in countries where less than $20,000 or less than 10% of international revenues has been generated in the last 24 months. To meet program requirements, project budgets should be set at a minimum of $20,000. Please Note: Food and beverage businesses are not eligible for CanExport grants; however, they may access the AgriMarketing program. To get started with the CanExport program, applicants must identify specific international export activities that they would like to invest in. Eligible businesses are encouraged to submit an application package well in advance of incurring their project expenses, as applications may take up to 25 business days to be reviewed and only costs incurred after an application is accepted will be eligible for grant reimbursement. Contact Mentor Works to discuss whether your project qualifies for CanExport grants and receive comprehensive application support to accelerate your company’s funding process. The Export Market Access (EMA) program offers small business grants to help companies in Ontario expand their presence within international markets. The program allows businesses to execute global marketing and expansion activities. Ideal projects should include exhibiting at foreign tradeshows, obtaining required foreign product certifications, and developing marketing materials to promote products in foreign countries. Eligible businesses can access up to 50% coverage of eligible expenses to a maximum $50,000 in Ontario government funding per application. Ontario-based businesses may apply for EMA up to two times within a 12-month period. Within each application, the candidate may request support for up to two different export activities. To access the Export Market Access program, applicants must complete and submit application package, which must be accepted before the business can incur eligible project expenses. Businesses may be able to receive pre-approval on unavoidable expenses prior to approval, such as trade show booth deposits to reserve their spot on the trade show floor. Contact Mentor Works to determine whether your project is a good fit for the EMA program. Our team can assist with your application to ensure your company is considered for funding. Canada’s economy depends on international business relationships and long-term exporting activities. Business owners looking to improve their company’s international competitiveness and profitability can access government grants to support export expansion strategies. 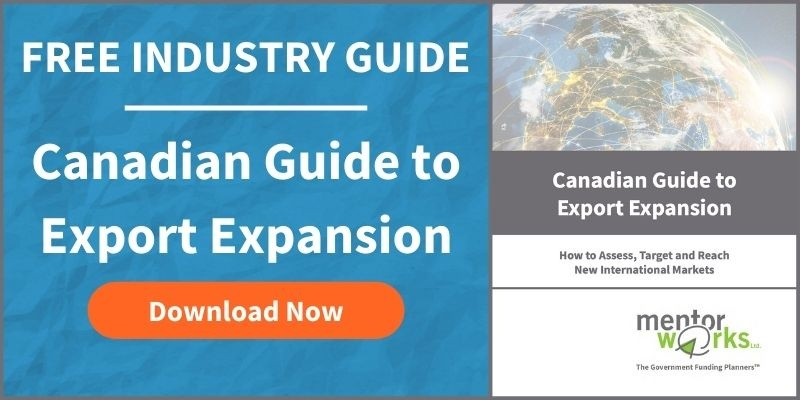 Download Mentor Works’ Canadian Business Guide to Export Expansion to discover a full range of business grants and loans designed to support exporting activities. Posted: July 14, 2014 by Katlynd Poulton. Updated: June 19, 2018 by Jeff Shepherd.